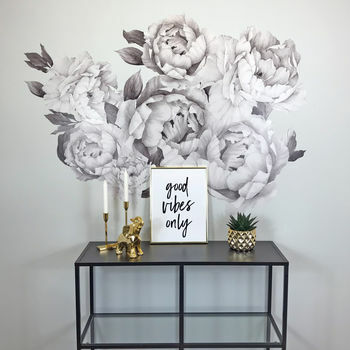 Our monochrome Peonies wall stickers are a fabulous focal point. Our new self adhesive fabric wall sticker range feature spring and floral elements that are right on trend. Crafted from a premium self adhesive fabric material, they can be re positioned up to 100 times. Fabulous for use in babies and children's bedrooms our wall stickers can be wiped clean and are super easy to install. Simply peel and stick. If you are not happy with the position of your fabric wall sticker, it can easily be removed and replaced on the wall. They can even be applied to corners to create a dramatic focal point in the corner of a room. Each element is applied individually meaning there are 1000's of combinations that can be created. Our fabric wall stickers make an amazing focal point in living rooms and grown up bedrooms too! Printed using environmentally friendly water based inks onto Premium Self Adhesive and repositionable fabric. These wall stickers can be wiped clean using a damp cloth. Each element is applied individually so overall size may vary. 7 x Peonies in various sizes plus assorted leaves.